Vitamin C (ascorbic acid) is a water-soluble vitamin that the human body needs every day. From infancy, vitamin C supports a wide range of basic functions that are vital to healthy growth and development. However, our bodies do not produce or store vitamin C we need. Therefore consuming vitamin C daily through whole foods, whole food supplements, or enriched foods and beverages with vitamin C is critical for overall health. Virtually every cell in the body depends on Vitamin C. It helps form and maintain healthy capillaries, gums, bones, teeth, cartilage, muscles and tendons. It strengthens blood vessels, improves blood circulation and reduces blood cholesterol. Vitamin C bolsters the absorption of iron. It is essential to the healthy, ongoing production of connective tissue, including forming collagen for healthy youthful skin. Vitamin C aids in iron absorption, protects against infections and assists the body in healing wounds. Vitamin C is concentrated in all the tissues that form the eye and the delicate capillaries in the retina Studies suggest long-term consumption of vitamin C also may reduce the risk of forming a cataract and vision loss from macular degeneration. All About Vision.com Vitamin C and Bioflavonoids: Powerful Eye Antioxidants Vitamin C has been known to reduce the risk of heart disease, certain cancers, infertility, liver disease and of course colds and flus. Vitamin C is also a powerful antioxidant that protects the body against harmful free radicals. Citric C Tabs are also formulated with bioflavonoids. The antioxidant properties of these compounds are more potent than vitamin C.
Want more vitamin C in your diet? Sweet red peppers have more than three times the vitamin C of orange juice. Bioflavonoids are plant pigments, which produce the yellow, red or blue colors in herbs, fruits, vegetables and plants. They are found in high quantities in green tea, citrus fruits (lemons, oranges and grapefruits, for example), and rose hips. Bioflavonoids are powerful antioxidants. They have been coined “nature’s biological response modifiers” because boost immune system’s ability to fight and eliminate viruses, carcinogens and allergens. Essentially, bioflavonoids have potent anti-inflammatory, anti-microbial and anti-cancer properties, that protect against oxidative and free radical damage caused by toxins and the body’s metabolic processes. Free radicals cause significant damage to the body at a cellular level and are one of the major factors that contribute to ageing. Polyphenols are type of Bioflavonoids (alpha one antioxidants) found in green tea. Polyphenols have been shown to offer even greater antioxidant protection than vitamins C and E.
Most vitamin C supplements only contain chemicals, artificial sweeteners, preservatives and other substances —which are difficult for the body to absorb and assimilate. These additives and chemicals can clog and stress the liver and kidney, making them work overtime to first cleanse the body of harmful substances. 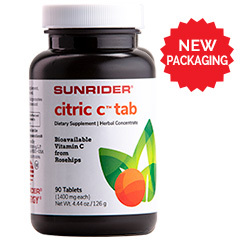 Sunrider’s Citric C Tabs are formulated with a proprietary blend of concentrated whole food sources of vitamin C, including green tea leaf extract and rose hips. These are also loaded with powerful bioflavonoids. This whole food blend ensures that the Vitamin C, minerals and enzymes in Citric C Tabs are easily, quickly and efficiently recognized, absorbed and utilized by the body. With Citric C™ Tab, you can enjoy the taste and nutrition of real oranges without all the mess and fuss of peeling them. Kids love the natural orange flavor, so it’s the perfect supplement for the entire family. Vitamin C can be found in a variety of Fruits, vegetables, berries and dark leafy greens. 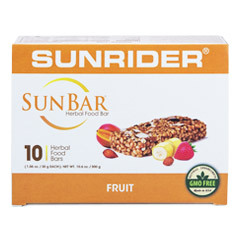 Here are a few of the the top plant based sources of Vitamin C.
Owner Expertise: Citric C Tabs are Researched, developed, and made by Sunrider in Southern California. Philosophy of Regeneration: Citric C Tabs provide essential nutrients to the body to support optimal health. Superior Ingredients: Citric C is formulated with concentrated herbal extracts, including green tea and rose hips. 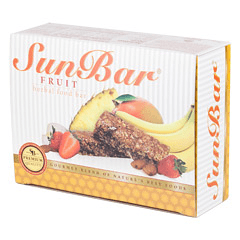 Nutritional Powerhouse: Contains concentrated antioxidants and citrus bioflavonoids. All Natural, Non GMO: No artificial flavors or colors: the dusty orange color comes from concentrated rose hips. Fits Your Life: Chewable tabs with a delicious natural orange taste that kids love. © 2016 The Sunrider Corporation dba Sunrider International. All rights reserved. 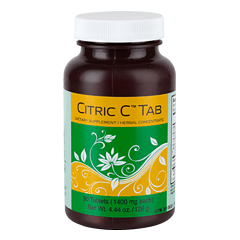 Recommendation: As a dietary supplement, take one to two Citric C Tabs daily. Panax ginseng is an ancient tonic herb which has been used as a qi (vital essence) tonic in Chinese medicine for about 5,000 years. A member of the Asian grouping of ginseng, it was introduced in Europe several times from the ninth century on, but assumed no importance in Western medicine until studies by Soviet scientists in the 1950s. Then it was established as an “adaptogen” (something that can be taken as food or a supplement that tends to normalize the body’s functions). 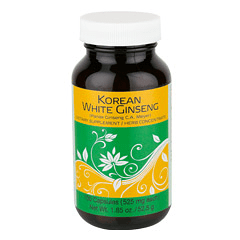 Korean White Ginseng traditionally has been used to help stimulate as well as relax the body’s systems. It is used as an adaptogen for increasing overall resistance to stress. A sweet herb used as a general tonic for improved well being, it has properties that are believed to improve concentration, memory, and work efficiency. Recently, many other beverage manufacturers have “discovered” the various health advantages of drinking green tea. 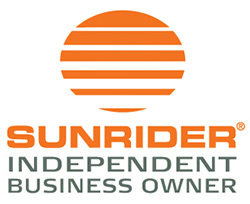 Sunrider has used it in Calli® for 20 years. 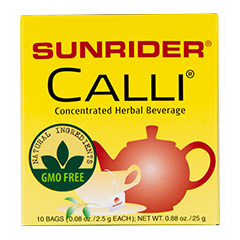 However, Calli® is much more than just green tea. 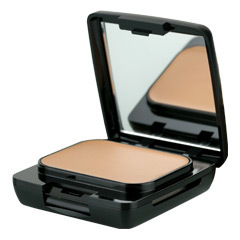 It’s an exclusive formula created using owner expertise with proven effectiveness. Catechins are naturally occurring polyphenol chemicals found in Camellia sinensis, the primary ingredient in Calli® (and Fortune Delight®). These antioxidants have been shown to be effective in absorbing damaging free radicals. While many of the undesirable elements we take into our body are quickly eliminated, others are not. Combined with a healthy meal and exercise program, the unique herbal extracts in Calli® assist in the body’s natural cleansing processes. 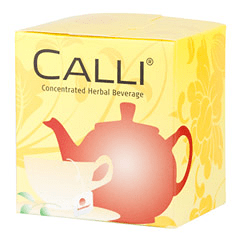 Dip one Calli® herbal tea bag into 16 oz. of water ( 480 ml ) for 5 minutes. 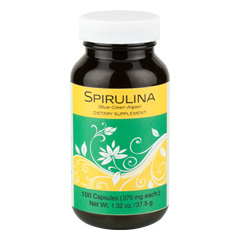 Spirulina is a species of edible micro algae. In bulk, it has a mild taste common to fresh water algae and has a long history of human consumption. The iron in blue-green algae has been found to be easily absorbed by the digestive system, unlike the iron found in spinach and various other plant sources. Spirulina is composed largely of protein and is noted for its essential and non-essential amino acids. It also contains Pro-vitamin A, which is converted to Vitamin A by the body. A hardy perennial that is native to the bogs and damp coniferous woods of China, Chinese Goldenseal Root is a pungent, very bitter herb. It is considered one of the major beneficial herbs in Chinese culture. Its bright yellow pigments have been used in dyeing. SunTrim® Plus is a breakthrough formula that helps you control portion sizes from day one! After 30 minutes, this groundbreaking supplement works by helping you feel fuller so you dont overeat. * As you continue to take it, SunTrim® Plus can help you achieve and maintain a healthy weight by encouraging healthy eating habits. 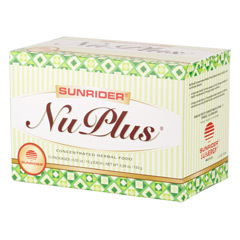 Sunrider founder and herbal expert Dr. Tei-Fu Chen designed SunTrim® Plus to be a safe, effective, natural solution to your weight-loss goals. 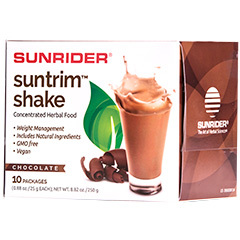 Unlike other weight-loss pills, SunTrim® Plus does not starve your body or make you feel sluggish, moody, or jittery. Instead, youll still have an appetite and enjoy food but will naturally feel like eating less. * Its a groundbreaking supplement that will give you the results you are looking for! Our concentrated herbal formula contains key ingredients such as cocoa bean, green coffee bean, resveratrol, green tea, and mangosteen. Owner expertise for safe, effective formulations. Consume three capsules, 30–45 minutes before meals. Anytime you are following a weight-loss plan, you should drink lots of fluids such as Fortune Delight®. 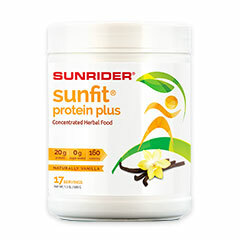 Drink it 30 minutes before each meal and throughout the day to help maximize the results of SunTrim® Plus. 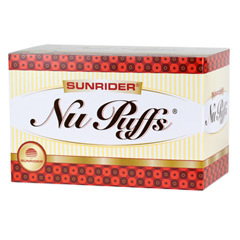 A healthy snack alternative, NuPuffs® are made with superior raw herbs in a unique formulation. 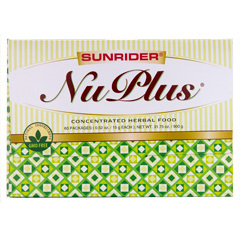 Sunrider uses NuPlus® herbal food as its base, an excellent source of complex carbohydrates.